I watch as green jewels with gold flecks wait to become butterflies. Two Monarchs pause in their chrysalises. 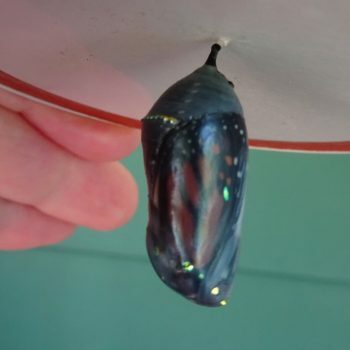 I check them many times a day, hoping to see darkening, hoping for orange wings to show through the chrysalis skin, hoping they’ll make it out of here in warmth and sunshine, hoping they’ll fly all the way to Mexico to join their tribe. Two others emerged, but I can’t release them. We wait together. It’s 50 degrees with thick fog between periods of hard rain. 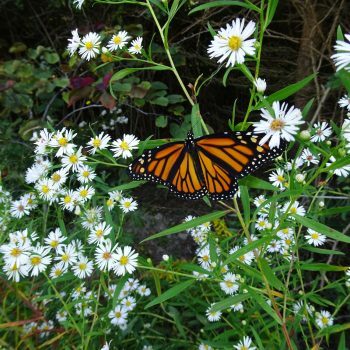 A Monarch needs 60 degrees and a partly sunny day to warm its wings, sip a little nectar, and head south. We’ll wait for a warmer day. Until then, I’ll feed them organic fruit jam. Then, I’ll wait for the last two stragglers to emerge. I waited for the right man to appear when I was 20 and in love with love. I didn’t know who I was waiting for. I hoped I’d know love when it appeared. I got lucky. My husband Vic hovered over me as though I was a darkened chrysalis and our baby was a butterfly. I waited for signs of birth when there wasn’t enough room in my skin to hold two bodies. I waited for the first weak contractions to become strong and fast so that we could go to the hospital for a natural delivery. “You’re only three centimeters dilated,” the nurse said when we got there. We waited all night as my body worked on its own schedule. 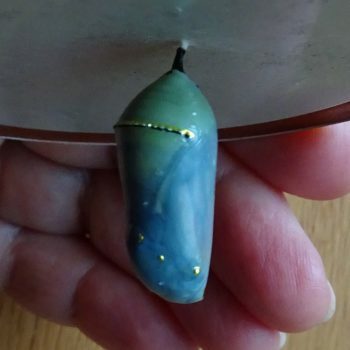 My husband Vic hovered over me as though I was a darkened chrysalis and our baby was a butterfly. I lay awake waiting for my teenage sons to arrive home when they were late. I watched at the window for Vic’s headlights when the roads were slippery on a snowy night. I waited for Vic’s death, hoping it would never come, wishing it would come faster. I waited for his release, and my mother’s, my brother’s, and mother-in-law’s. I hoped the transitions would be smooth and gentle, hoped the dying one would let go like a butterfly and move toward a destiny I could only imagine. It was never up to me. I learned more about waiting when Vic and I spent six weeks in Switzerland with Paul Brunton, a philosopher, writer, and wise human being. In his 80s then, I was honored to prepare food he enjoyed, help him organize his office, and cut his hair. I loved sitting with him in silence in a church in Lausanne after eating at a vegan restaurant where the soup had to be sent back to the kitchen for heating. PB, as we called him, waited patiently. The onion-scented soup wasn’t steaming when it arrived, so PB settled for lukewarm. PB, in his 80s, struggled with French vocabulary although he’d once been fluent. Vic and I didn’t speak French, so we misread the train schedule and missed our train back to Montreux. “We’ll have to wait a few hours,” Vic said. “I’m sorry, PB.” We knew he was tired. I remembered that moment later when life forced more pauses. Don’t get agitated when the machine breaks down during Vic’s CAT scan. Don’t be impatient while waiting for his white blood cells to soar after a stem cell transplant. Don’t expect to be in charge of life and death. Watch and observe. Take a deep breath. Pause. Notice that ray of light breaking through the clouds. Notice the Monarch’s wings flutter as it tastes the jam. I wait for political transformation. I wait for human beings to face climate change and our unhealthy romance with fear and cruelty. I wait for sane and moral politicians with high ideals. I wait with no idea what will happen next or if it’s even possible to redeem ourselves. I wait, grateful for my small kingdom of butterflies and wildflowers. I take the last gladiola of the season to Vic’s gravesite. I admire the quiet Monarch waiting for its time to fly. Elaine Mansfield’s book Leaning into Love: A Spiritual Journey through Grief won the 2015 Independent Publishers Book Award Gold Medal for Aging, Death, and Dying. Her TEDx talk is “Good Grief! 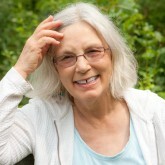 What I Learned from Loss.” Elaine facilitates workshops, volunteers with hospice, spends time in the forest, and writes a blog at her website elainemansfield.com. This article originally appeared on gratefulness.org.